Wonder Lake at Denali National Park, Alaska. Denali (Mount McKinley), the highest mountain peak of the United States and North America, in background. Where in the United States is Alaska? Location map of Alaska in the US. The largest US state occupies a huge peninsula in extreme north west of North America, with coastlines on the Arctic and North Pacific oceans and on the Chukchi and the Bering Sea. The state is separated from the contiguous 48 US states by Canada and from Russia by the Bering Strait. 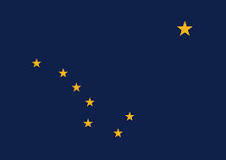 Alaska is one of two US states not bordered by another state, Hawaii is the other. Alaska is bordered by Canada (by the Canadian provinces of Yukon Territory and British Columbia) to the east, and it shares a maritime border with Russia to the west. The state's nickname is "The Last Frontier". The history of Alaska dates back to the Upper Paleolithic period, genetic findings suggest that a single population of modern humans migrated from southern Siberia toward the land mass known as the Bering Land Bridge as early as 30,000 years ago, and crossed over to the Americas 16,500 years ago. . Because the Bering Land Bridge is now under water, archeological artifacts are practically nonexistent. However archeologists have discovered artifacts on land that provide evidence of human activity in North and South America dating roughly 12,000 years ago. At the time of European contact by Russian explorers, the area was populated by Alaska Native groups. 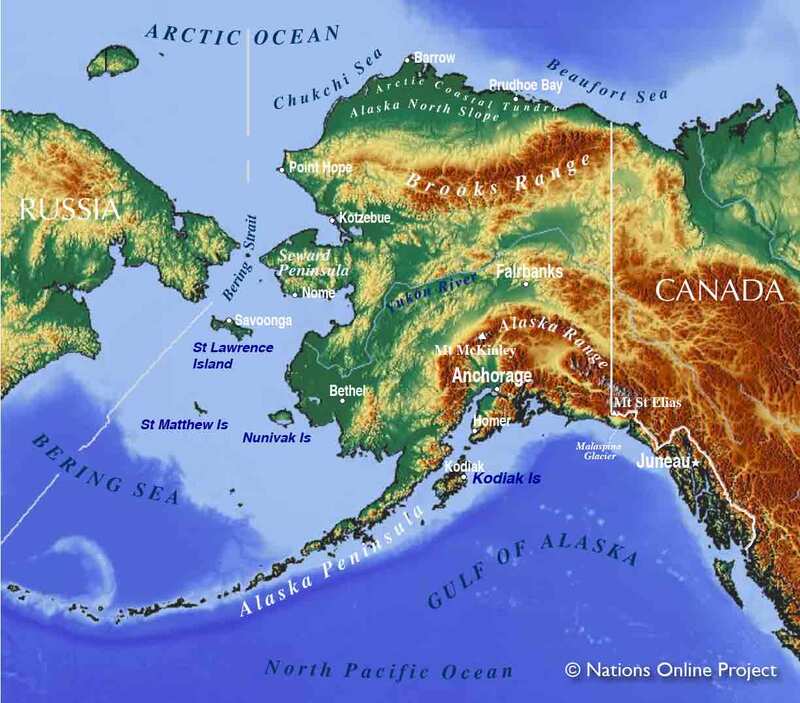 The territory of Alaska was a Russian colony from the 1740s until 1867 when it was purchased from Russia. Admission to the Union on the 3rd January 1959, it was admitted as the 49th state. After oil was discovered in 1968, a pipeline was completed in 1977 to carry the oil from the North Slope to the former Gold Rush town of Valdez, today one of the most important ports in Alaska. 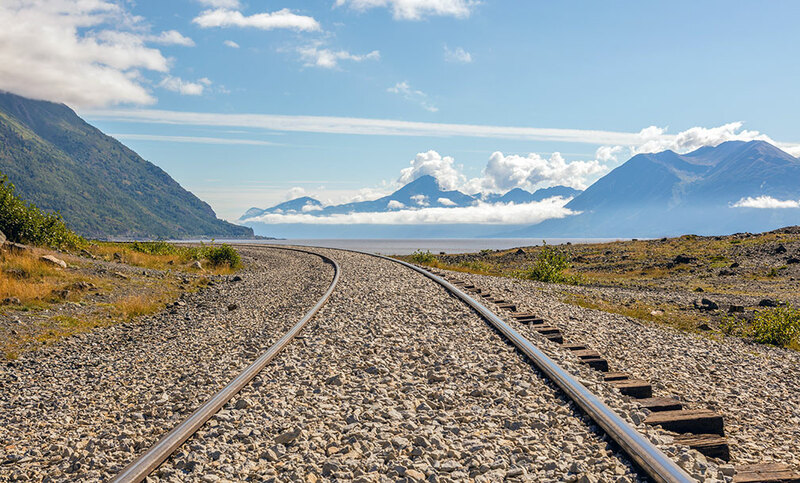 Scenery near Beluga Point Lookout south of Anchorage, Turnagain Arm (Gulf of Alaska) in background, seen from the rail tracks of Alaska Railroad. The state occupies an area of 1,723,337 km² (665,384 sq mi)  making it the largest state in the US, compared, it is three times the size of the Iberian Peninsula. 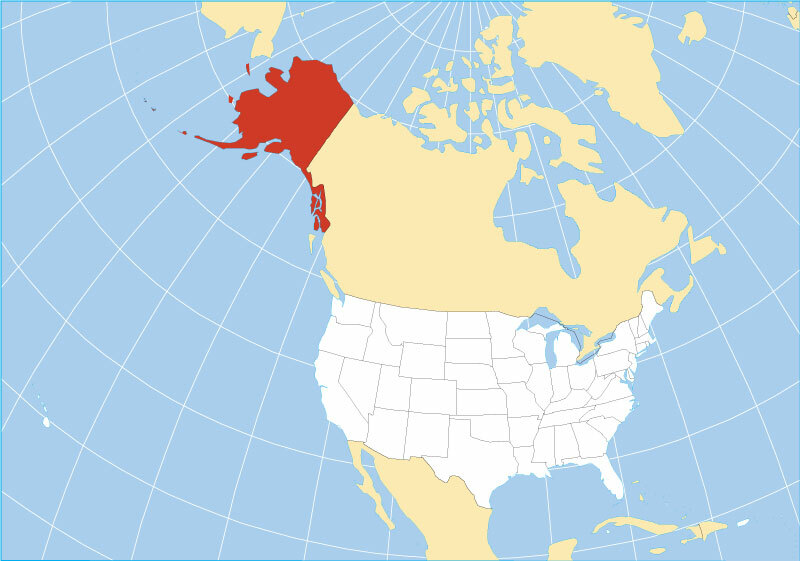 Compared with other US states by area, Alaska is 2.5 times the size of Texas, but New Jersey would fit 76 times into Alaska. 1. Far North or Arctic Alaska, the vast area roughly north of the Yukon River and the Arctic Ocean. Originally inhabited by various Alaska Native groups living off hunting and fishing. The Far North includes the Brook Range and the Arctic coastal tundra. Most of Arctic Alaska lies within the Arctic Circle. The area offers midnight sun in summer and polar nights in winter, the aurora borealis or "northern lights" may be seen between late August until April. 2. The wilderness area of the Interior in central Alaska south of the Brook Range is centered around Fairbanks, the largest city in the Interior, and bounded by the Alaska Range in the south. The region was originally inhabited by native Athabaskan people, a hunter-gatherer society. 3. Alaska's Southwest region along Kuskokwim Bay and Bristol Bay includes the Nunivak Island, the Yukon Delta area, Alaska Peninsula and the Aleutian Islands chain, and the Kodiak Archipelago. 4. Southcentral Alaska, is situated roughly between the Alaska Range and the south coast at the Gulf of Alaska. Centered around Prince William Sound. The region is subdivided into the Mat-Su Valley (Matanuska-Susitna), the Copper River Valley, the Anchorage Area, and the Kenai Peninsula. 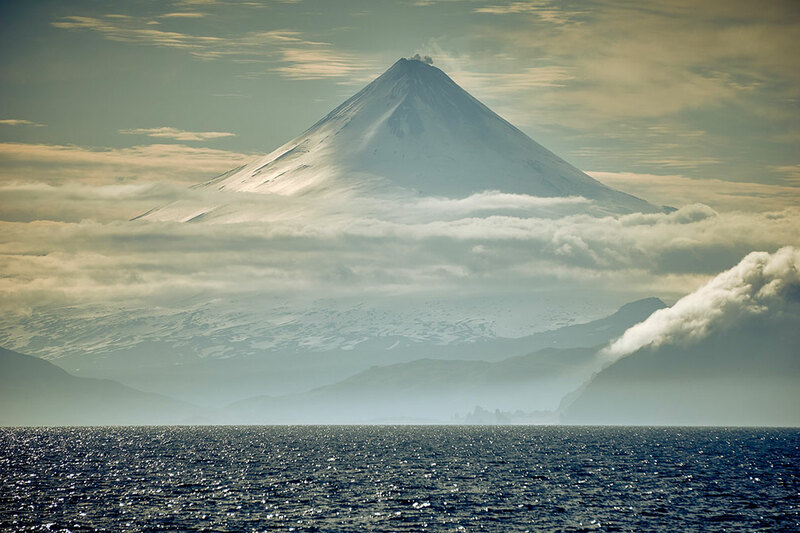 Shishaldin, an active volcano on Unimak Island in the Aleutian Islands. It is probably the most symmetrical cone-shaped glacier-clad large mountain on the planet. When the United States purchased Alaska from the Russians for $7.2 million, included in the package were all ten of the highest mountains in the US. Number one in hight is Denali (also known as Mount McKinley and Bolshaya Gora), the highest mountain in Alaska, the United States, and North America at 6190 m (20,310 ft) is located in the Alaska Range in the southern part of the peninsula, it is the highest range in the world outside Asia and the Andes. View of Iliamna lake situated at the northern end of the Alaska Peninsula, it is the largest natural freshwater lake in Alaska with a surface area of almost 3,000 km². Largest natural freshwater lake is Iliamna, with 2,978 km² (1,150 sq mi). Alaska has 94 lakes with surface areas of more than 25 km² (10 sq mi) among Alaska's more than 3 million lakes. 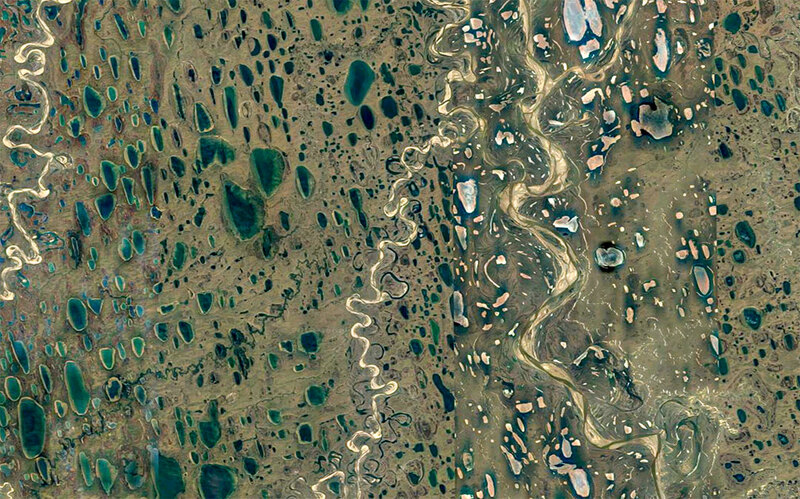 Longest river is the Yukon, with a length of 3,017 km (1,875 mi) in Alaska and 3,698 km (2,298 mi) total. There are more than 3,000 rivers in the state. The Yukon River ranks third in length of U.S. rivers, behind the Mississippi and Missouri rivers. 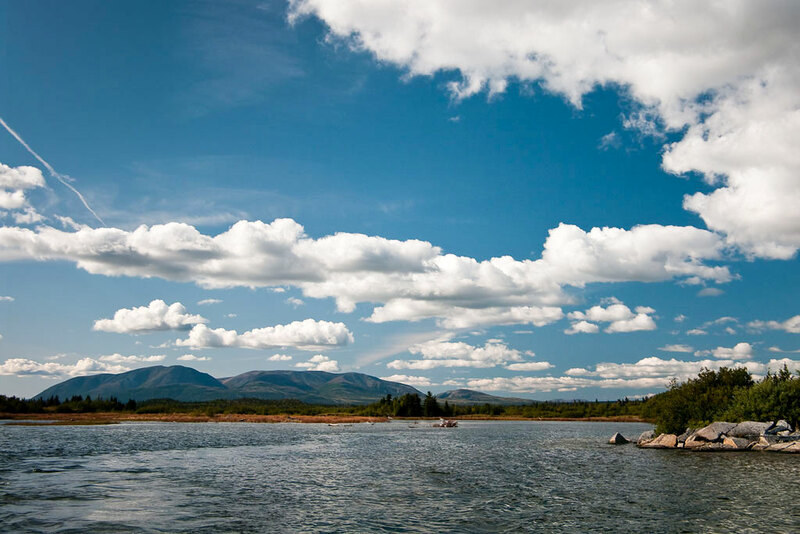 Koyukuk River, Kanuti National Wildlife Refuge in late summer. 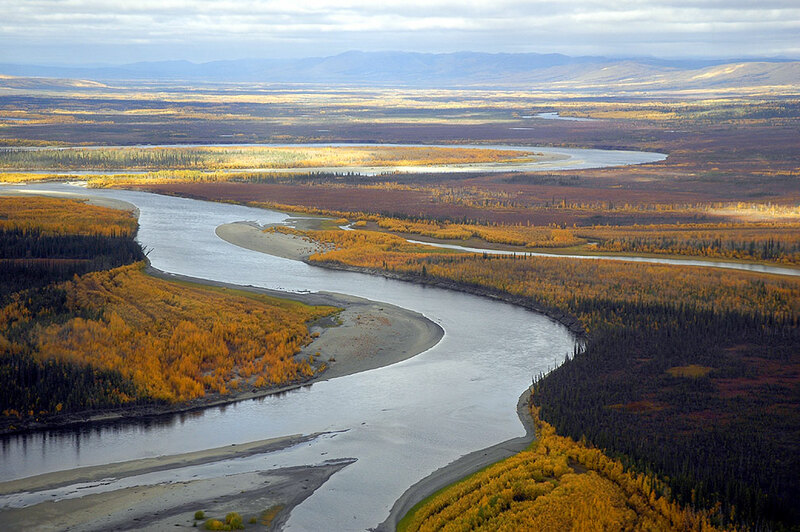 Yukon River; the Kobuk River in northwestern Alaska empties into the Kotzebue Sound; the Koyukuk in Central Alaska is a 684 km (425 mi) long major tributary of the Yukon River; the Tanana River in central-west of the state is a 940 km (584 mi) long tributary of the Yukon River, the Kuskokwim in Southwest Alaska provides the major drainage for a large area of the Alaska Interior, it empties into the Kuskokwim Bay on the Bering Sea; the Susitna River, the "sandy river" empties into the Cook Inlet of the Pacific Ocean; the Copper River drains a large region of the Wrangell and the Chugach Mountains, it flows into into the Gulf of Alaska. Largest island is Kodiak Island in the Gulf of Alaska, separated from Alaska's mainland by the Shelikof Strait, the island has an area of 9,293 km² (3,588 sq mi), making it slightly larger than Cyprus. There are 1,800 named islands in the state, 1,000 of which are located in Southeast Alaska. 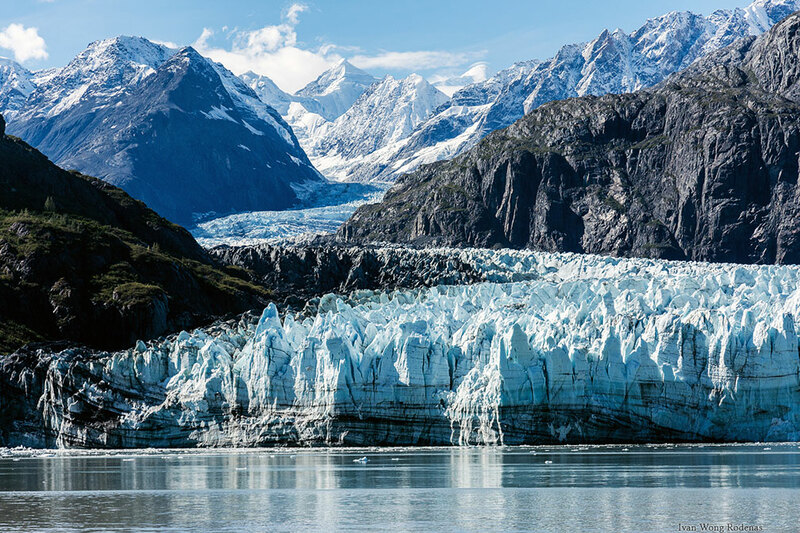 Glacier Bay National Park in Alaska is part of an international UNESCO World Heritage Site in Alaska. Glacier Bay is one highlight of any Alaska cruise. Alaska shares a UNESCO World Heritage Site with Canada. The site is named Kluane / Wrangell-St. Elias / Glacier Bay / Tatshenshini-Alsek . The national parks and protected wilderness areas along the border of Canada and the United States contain some of the highest peaks in North America, the largest non-polar icefield in the world as well as examples of some of the world’s longest and most spectacular glaciers. The spectacular natural landscapes are an area of intense tectonic, volcanic, glacial and fluvial activities. They are home to an abundance of wildlife with grizzly bears, caribou, Alaskan moose, Canadian lynx, and Dall's sheep, marine mammals and anadromous fish. Kluane National Park (http://www.pc.gc.ca/en/pn-np/yt/kluane), includes the highest mountain in Canada, Mount Logan (5,959 m or 19,551 ft). Wrangell–St. Elias National Park, (https://www.nps.gov/wrst/) America's largest national park includes Mount St. Elias, the second highest mountain in both the United States and Canada (5,489 m or 18,008 feet). Glacier Bay (https://www.nps.gov/glba/) Glacier Bay National Park, a wilderness area and a biosphere reserve in the Inside Passage (Alaska panhandle) west of Juneau. The park covers an area of 13,350 km² (5,150 sq mi) , features high peaks like Mount Fairweather, and glaciers like the vast Grand Pacific Glacier. Alaska State Capitol in Juneau, Alaska's capital. 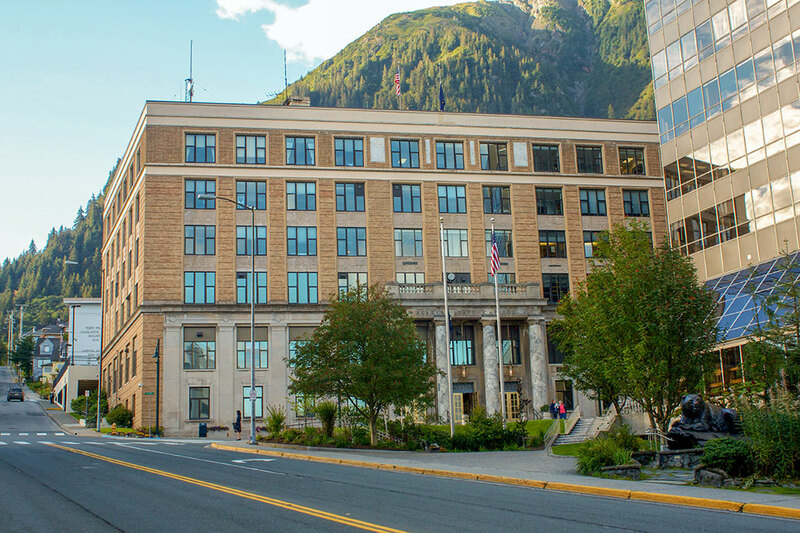 The Art Deco style building houses the bicameral Alaska State Legislature. This vast territory has a population of just 742,000 people (est. 2018) , it is the third least populated state in the US. Capital city is Juneau, located in the Alaskan panhandle in the southeast region (Inside Passage), largest and most populous city	is Anchorage. Busiest airport is Ted Stevens Anchorage International Airport (IATA code: ANC). Anchorage (292,000), Fairbanks (32,000), Juneau (31,000), Badger (Fairbanks MSA), Knik-Fairview (Anchorage MSA), and College (Fairbanks MSA). 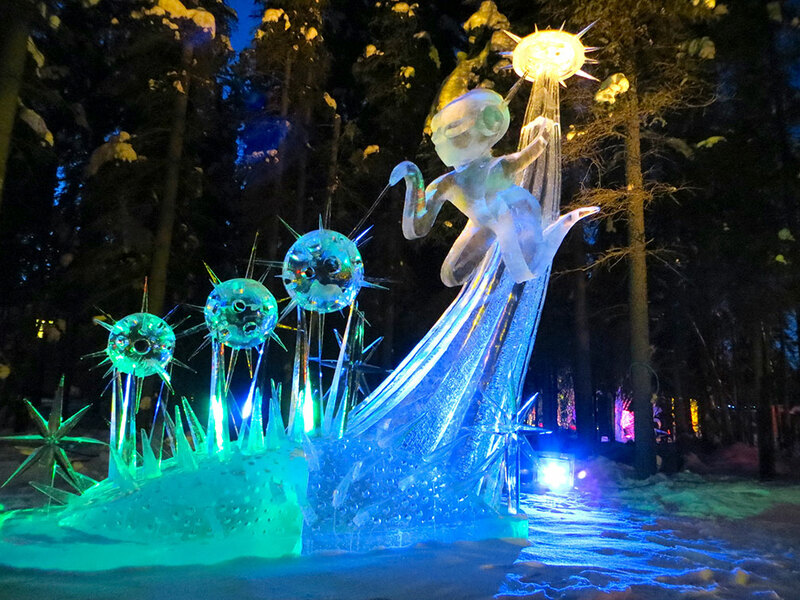 Ice sculpture in Fairbanks, Alaska. Adak, Attu, Barrow, Bethel, Bettles, Chignik, Circle, Dillingham, Galena, Gambell, Glennallen, Holy Cross, Homer, Hooper Bay, Kenai, Ketchikan, King Salmon, Kodiak, Kotzebue, Nenana, Nome, Palmer, Prudhoe Bay, Selawik, Seward, Sitka, Skagway, Tok, Unalakleet, Unalaska, Valdez, Wainwright, and Wrangell. 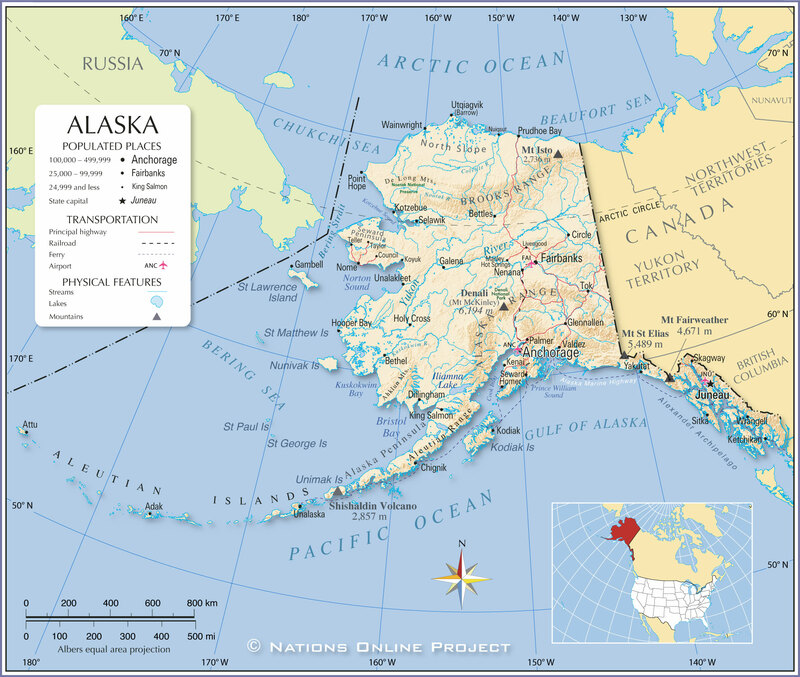 The detailed map below is showing the US state of Alaska with boundaries, the location of the state capital Juneau, major cities and populated places, rivers and lakes, interstate highways, principal highways, and railroads.